A good wine needs to mature. The same applies to visions, ideas and plans. With GRAPEVINE 51, this has progressed to the point where we would like to give you an insight into our future-oriented residential concept, which is unprecedented in Germany. And like a wine that gains depth over time, the contents of this website will become more detailed and in-depth. So feel welcome to drop by again or contact us directly. We’d be delighted to give you more information! 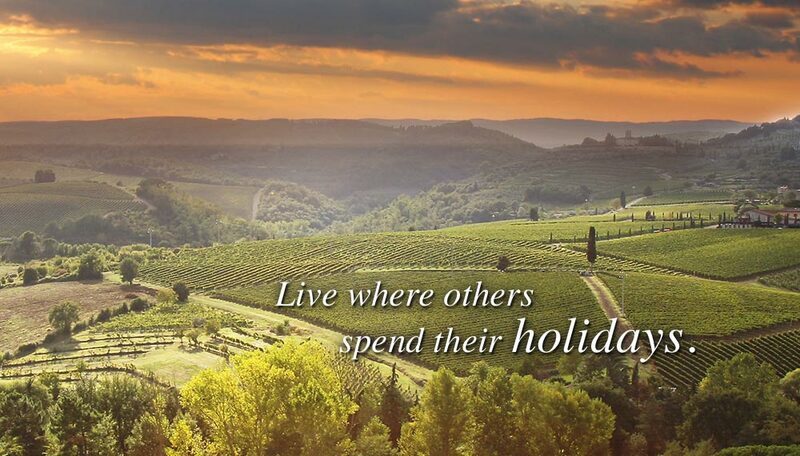 Live like you are on holiday – and still be at home. GRAPEVINE 51 Resorts & Parks offer much more than high-quality holiday homes. They are a kind of “home away from home” for discerning people over 50. A neighbourhood with a similar age structure that values its privacy, but at the same time also extra service and a sense of community. You can learn more about the GRAPEVINE 51 concept here. Arrival. Well-being. Return. The locations of GRAPEVINE 51 offer the maximum in quality of life. Climate, landscape and culture make them an ideal home away from home where you will love to stay longer. You can learn more about the locations for the GRAPEVINE 51 concept here. From planning to management – a concept with high standards requires discerning partners. That is why, in every area, GRAPEVINE 51 works exclusively with companies that excel in their experience, competence and creativity. You can learn more about the partners in the GRAPEVINE 51 concept here.